When Gov. Snyder makes it happen, it's done on a massive scale. This past week will no doubt be chiseled into history as the start of a revolution in job opportunities for Michigan students yearning and learning to be workers. A plethora of initiatives were announced, along with legislation enabling them, aiming to vault Michigan's education system into 21st-century alignment. It's been a long time coming, but the initiatives are welcome and are coming in time to rescue the state and the education system from the economic doldrums. Gov. 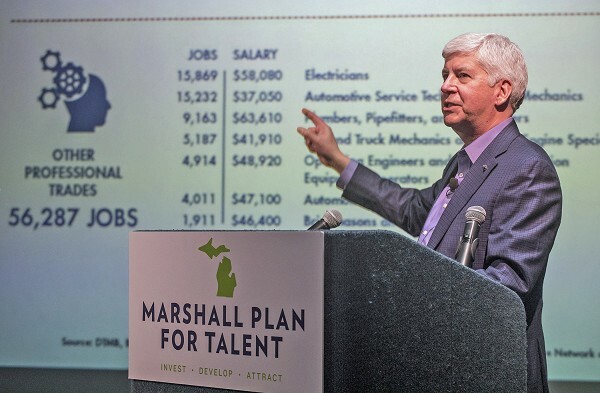 Rick Snyder on Thursday signed into law the framework of the Marshall Plan for Talent, connecting employers with educators to equip students with in-demand careers, aiming at filling more than 800,000 open jobs. The Marshall Plan encourages apprenticeships and mentorships with an educational focus on certifications and occupational licensing. "As I travel throughout the state of Michigan, the question I hear most often has changed dramatically from "where are the jobs?" to "where is the talent?" Gov. Rick Snyder said. "In Detroit, which has become an innovative tech hub, they're doing incredible things in career readiness with coding certifications. In the U.P., I've seen students building houses based on high school geometry skills. In Muskegon, a new cutting-edge skilled trades center is the focus of downtown. "So many areas of the state are changing their approach to education, and the Marshall Plan for Talent brings everyone together on the best approaches to match educational skills with available well-paying jobs." Talent and Economic Development Department of Michigan Director Roger Curtis said: "Michigan wins when we all work together to remove barriers and address challenges head-on. That's what the Marshall Plan for Talent is about. Michiganders have a strong work ethic -- second to none. And by bringing business and education together to develop the world's best education and training system, we will become global leaders in talent development and ensure Michiganders have the skills needed to capitalize on their get-it-done attitude." "Today is monumental for Michigan students and schools," Interim State Superintendent Sheila Alles said. "As we continue to work toward making Michigan a Top 10 education state in 10 years, the Marshall Plan for Talent will serve as a catalyst for continued innovation that ensures our young people get a world-class education that is meaningful to them and prepares all for success and to become lifelong learners. It is something that the late-State Superintendent Brian Whiston worked very hard to achieve and fulfill." There are expected to be 811,000 open jobs in fields such as IT, health sciences and manufacturing in Michigan through the year 2024. Set aside $100 million to prepare students for the 21st-century economy, including $10.5 million for career navigators, who are dedicated to helping guide students toward their career and associated academic goals. These navigators will be supported by additional tools such as a web-based career exploration platform that connects students to internships, job shadowing opportunities, and other such options in their local area. Create Marshall Plan Talent Consortiums - groups of educators and employers that partner to change the way students are prepared for careers. This will truly connect educators and employers to ensure that students experience a seamless transition from school to employment to lifelong learning. Creates an awareness campaign for attracting businesses and talent to Michigan. The bills are now Public Acts 227 and 228 of 2018. House Bill 5139, sponsored by state Rep. Daire Rendon, requires the Michigan Department of Education, in consultation with the Department of Talent and Economic Development, to develop and make available a model program of instruction in career development. The bill also requires that beginning in the 2019-2020 school year, schools incorporate grade-appropriate instruction on career development in each grade level from K - 12. The act is left intentionally broad to allow for flexibility and promote innovation. This section of the act is now known as "The Superintendent Brian Whiston Career Pathways Law." The bill is now PA 229 of 2018. HB 5145, sponsored by state Rep. Julie Alexander requires the Michigan Department of Education to develop rules that allow an individual to use time spent engaging with local employers or technical centers to count toward the renewal of a teaching certificate. The bill is now PA 234 of 2018. HB 5141, sponsored by state Rep. Bronna Kahle, allows non-certificated individuals with professional experience to teach in an industrial technology or career and technical education program for up to 10 years. The bill is now PA 235 of 2018. SBs 684 and 685, sponsored by state Sen. Ken Horn and Peter MacGregor, respectively, require schools to provide more meaningful and frequent use of Educational Development Plans for students, along with an opportunity to develop a talent portfolio. Schools must include information in their school improvement plans, information on how the school will provide career information, experiences, work-based learning opportunities, and programs of instruction. The bills are now PAs 230 and 231 of 2018. SB 175, sponsored by Sen. Jim Stamas, allows students who graduate high school through the year 2024 to fulfill one credit of the foreign language requirement by completing a department-approved formal CTE program or curriculum. The bill is now PA 232 of 2018. SB 889, sponsored by state Sen. Marty Knollenberg, would remove the basic skills exam (BSE) from the requirements to teach for more than one year as a noncertified teacher in a shortage area such as computer science, foreign languages, mathematics, biology, chemistry, engineering, physics, robotics, or other courses that the state board determines appropriate. The bill is now PA 233 of 2018. HB 4069, sponsored by state Rep. Jim Tedder, would amend current law to allow the board of a school district to employ an individual without a teaching certificate as a substitute teacher if the individual has 60 hours of college credit or an associate degree from a college, university, or community college. The bill is now PA 236 of 2018. More detailed information on the $100 million allocated for the Marshall Plan can be found at http://www.legislature.mi.gov/documents/2017-2018/billanalysis/Senate/pdf/2017-SFA-0941-E.pdf. For more information on the Marshall Plan, visit mi.gov/marshallplan.